Have you noticed the big blue badge that's appeared in my right side bar? 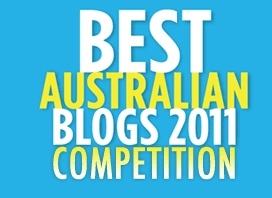 My blog has been nominated for Best Australian Blogs 2011 Competition. Voting has opened in the People's Choice Award. If you go to the People's Choice Award page and click the VOTE HERE button, you can register a vote for The Book Chook. You get a survey monkey screen that offers you an A-Z list of blogs. The Book Chook is on the third page, under T (hit "next" button to go to it). You then need to enter your name and email address. And you're done. It took me one minute to vote for one of my favourite blogs, BeAFunMum. If you have the time and the inclination, thanks for supporting my blog!